Five hours isn’t usually enough time to really experience an entire city or town but five hours is what I had. 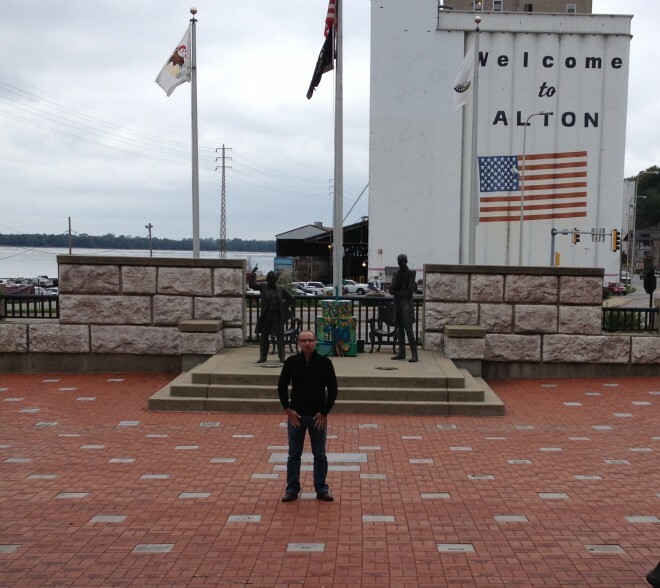 With the help of Alton’s Convention & Visitors Bureau and its President/tour guide, Brett Stawar – we made the most of what little time I had, taking in Alton and the surrounding communities at a rapid pace! 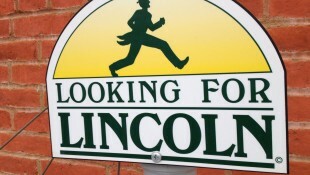 In every city and town in Illinois – Abraham Lincoln is a tourism grand slam. The state’s current national tourism ads portray a clever cartoon of the 16th U.S. President being wowed at all of the things to see and do in the “land of Lincoln”. Alton has multiple Lincoln hot spots including a set of statues representing the seventh and final Lincoln/Douglas debate. At the time, Lincoln was running for Senate in Illinois and eventually lost. However, the transcribed text from those debates and a book that included portions of his stump speech, would begin his launch to nominee for President. Here you can pose for a photo with the statues in the area the debate took place in 1858. 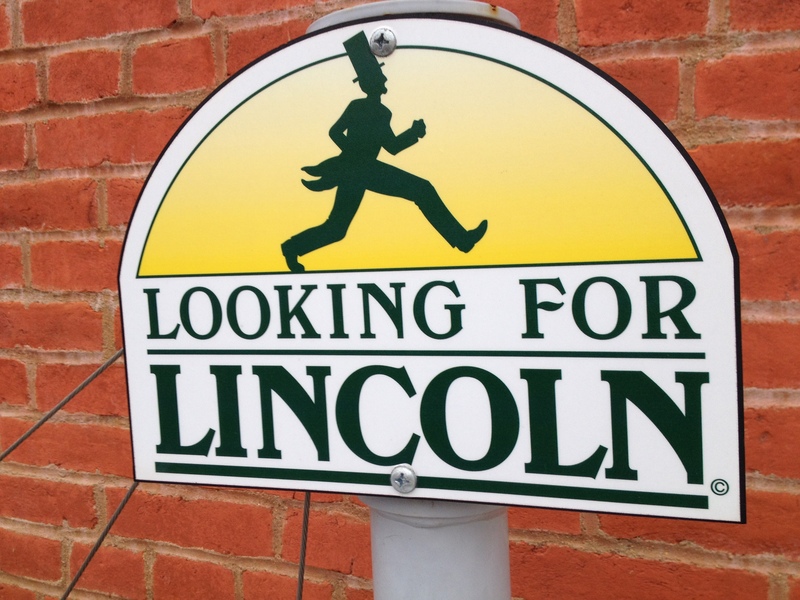 Alton also has a Lincoln Trail that allows visitors to use a brochure or mobile app to discover points around town that have an Honest Abe connection. Some spots include a Civil War era cemetery, a confederate prison and the site of a famous duel – that never actually took place. If a potential ghost sighting doesn’t keep you away – the views along what’s known here as “the great river road” are spectacular. The merging of the Missouri, Illinois and Mississippi rivers is a neat sight to see. In fact, through out the region – visitors have an opportunity to learn and experience the importance of these waters, in particular the “Mighty” Mississippi. I must say – I certainly didn’t start the day thinking I’d wind up on top of a massive lock and dam. Yet – there I was. Just a few yards away from the National Great Rivers Museum is the Melvin Price Locks and Dam structure. Staring down at the water’s current easily moving giant portions of dead tree trunks down stream makes you realize just how awesome the power of the Mississippi river really is. Another great view of the river and the surrounding area is at the Lewis & Clark Confluence Tower in a neighboring town of Hartford, Illinois. The structure isn’t incredibly fancy but if the goal was to capture a great scene – mission accomplished. The metal bars keeping visitors safe makes taking photos a bit of a challenge but you can easily see all the way to downtown Saint Louis on a clear day. On a cloudy day, the views of the river and the rest of the region are still worth a visit to the top. 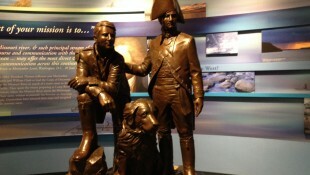 Lewis & Clark, the early American explorers are said to have begun their westward journey from Alton. In addition to the confluence tower location, down the road you’ll find an interpretive center that tells the story of both men and their travels. A well laid out museum lets guests walk through and learn about the journey from start to finish. One interesting piece was a ship replica that showed the challenge of packing and preparing for a journey of this scale. Behind the center you’ll find a replica of the early shelters and cabins the crew used during their time in the area. Lewis & Clark weren’t the only names made famous in Alton. Jazz singer Miles Davis was born here. The world’s tallest man, Robert Wadlow was also from the area. Wadlow, who lived until age 22 was the tallest man to ever walk the Earth at 8 feet, 11.1 inches. His incredible height naturally brought him attention all over the country – much of it self inflicted as he signed a touring deal with Ringling Brothers in 1937. He’d later become a representative for International Shoe Company and would wind up visiting over 800 towns during his life time – showing off his height in personal appearances. 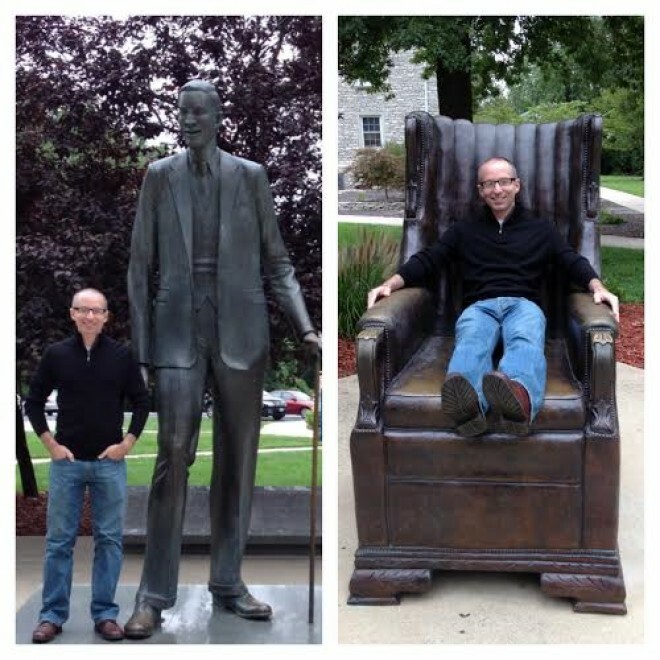 Two statues saluting Alton’s “gentle giant” are great photo ops for tourists – one statue of the man himself and another of a custom chair that was built for Wadlow. This is actually a horrible representation of Mr. Wadlow’s abnormal size as most photographs I have generally show people towering over me. One thing Alton is perhaps best known for is bird watching. A quick stop into the Audubon Center at Riverlands explains how the area is one of a handful of places in the U.S. that offer prime viewing of migrating birds. Call it luck – but my first glance into a stationary set of binoculars in the lobby showed a beautiful bald Eagle perched upon on a tree limb across a bay of water. The area hosts bird watching groups and experts through out the year with Eagle watching being one of the most popular activities among birding enthusiasts. And what would a trip to a new town be without discovering a great place to eat? 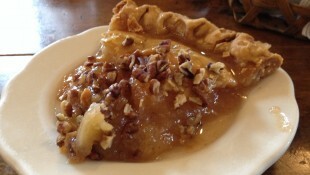 The area has a number of great restaurants but our lunch option was a hot spot known as My Just Desserts where owner Ann Badasch has become notable for her wonderful homemade pies. I tried the Apple Praline – the last one left for the day – and it met all expectations. A chalk board on the wall indicates which pies are available to patrons during the lunch hour. When the pie is gone – a server erases the option from the board. As time ran out on my journey around Alton, I was honored to be the guest emcee at an event that evening for the Miles Davis Memorial Project which raised money for a Miles Davis statue to be displayed downtown in Spring of 2015.